Let's not get ahead of ourselves here with the Juan Uribe accolades. Yes, he's rounding up to a robust (for him) six-game hitting streak (the eight hits Uribe has gotten over these six games amount to over a third of the total hits Uribe has had all year). Complemented with a lack of playing time, Uribe has seen his batting average increase from .231 to .280. Uribe was the target of ridicule the last two years. Over his anemic hitting, his roundish physique and $21-million contract. Not to mention guessing when the Dodgers would finally cut bait. Yet here he is, not only surviving but actually playing pretty well -- even fantastic compared with expectations. Uribe, 33, is batting a respectable .278, a dramatic improvement over his .199 average with the Dodgers the last two seasons. He has a .404 slugging percentage, or 142 percentage points higher than he averaged for the Dodgers the last two seasons. And he has a .389 on-base percentage (15 walks in 95 plate appearances), a whopping 100 points higher. If he maintains that, it would be a career-high by 76 points. Juan Uribe, our very own round mound of rebound. Uribe's latest week of eating up opposing pitching shouldn't be cause for parades. It's unsustainable. He's hitting 30 points above his career batting average, not to mention almost eighty points above tha pathetic Mendoza-Line levels he's floated the last two years as a Dodger. 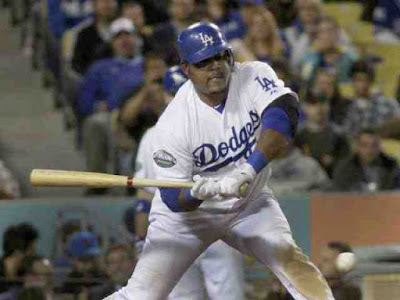 Uribe happens to be connecting despite having an increasingly violent and frighteningly spastic swing, as he flails and "buffets" the air. It is great that Uribe happens to be connecting, sure. For now. But Uribe clearly lacks a disciplined approach to the plate and yes, that is a quality double entendre, thank you very much. Just because Uribe happens to be a better alternative, today, relative to the woeful (but possibly rebounding of late) Luis Cruz, does not make Uribe a viable option at third. Certainly not for a team that aspires for greatness beyond just girth. If the media keeps writing Uribe valentines, Ned Colletti might go sign him up for five more years. Snap out of it!